I first came across a hymnal wreath last year while antiquing with my mother for my wedding. I was astonished to find that they were selling a hymnal wreath – which was obviously lacking the fullness it needed – for $45. My mom and I both looked at it and then looked at each other, we knew that we could easily make this! For my wedding we made a large hymnal wreath using one hymnal – due to lack of resources. After the wedding I ripped it apart and put it back together using 4 hymnals to give it a fuller look over our bed. I had so much fun making it that I decided to make another one for our shelf. 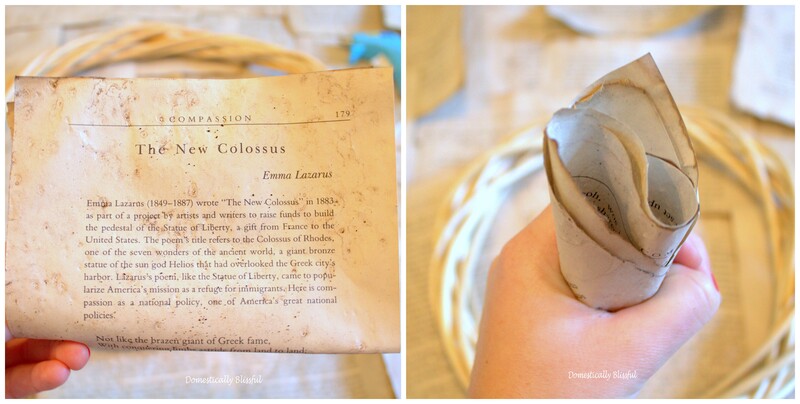 I now have a third paper wreath made from book pages that I antiqued, and I thought I would show you how easy it is to make these paper wreaths! 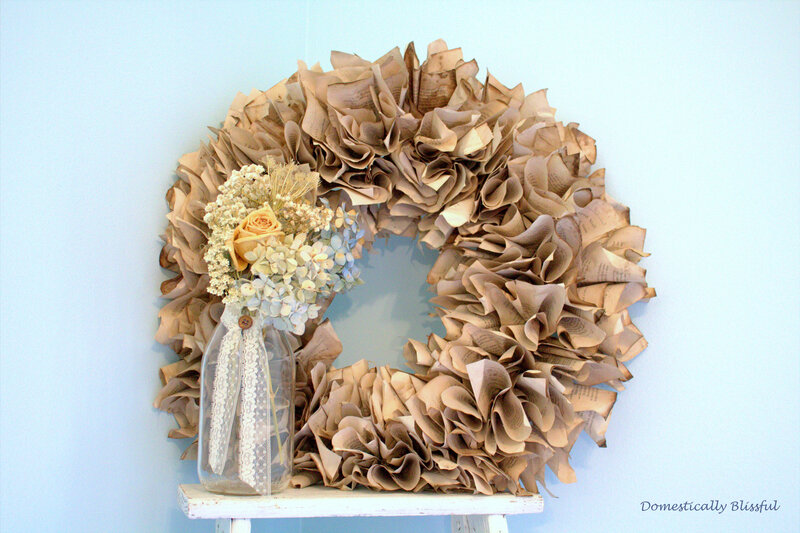 All you need is a wreath, antique paper, and a hot glue gun with glue. First, you take a piece of paper and fold it in half. Then pinch the bottom-middle of the page and using your other hand, wrap your fingers around the base of the paper and move upwards to create this look. Then flatten the bottom, add glue, and place on the wreath. – Some people like to wrap the wreath before place the paper on it, but nobody can see the back. In addition, by not wrapping the wreath with fabric the vines are left exposed in the back allowing you to easily can your wreath by running twine through the back. 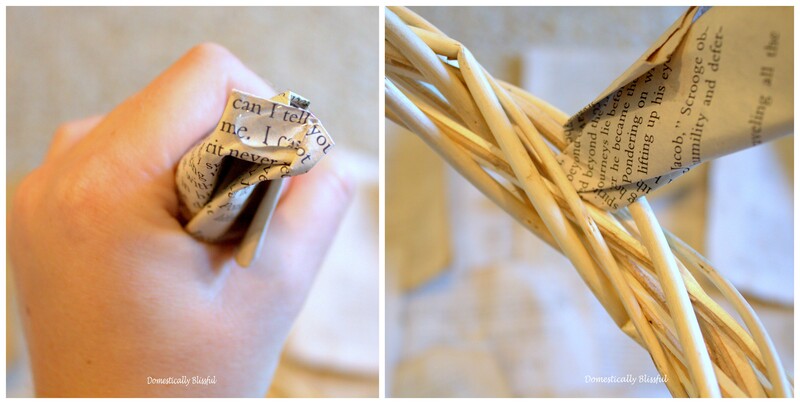 Continue this process of folding and gluing the pages unto your wreath. 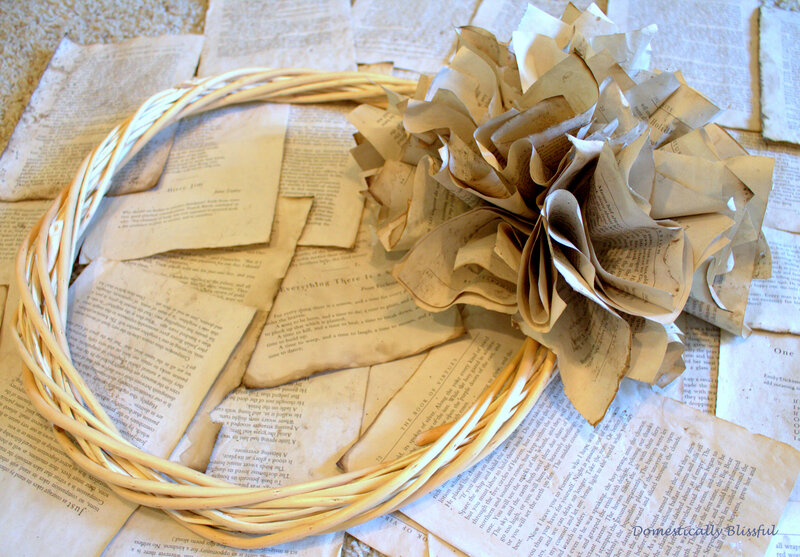 This is how your paper wreath should look once completed! We now have 6 wreaths in various places around our home. I love wreaths! Thanks! I’m not exactly sure what you mean by the embellishment, but in front of the wreath is a glass jar decorated with lace and a button holding dried flowers from my wedding. 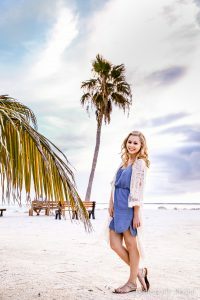 Just gorgeous, thanks so much for sharing! I am glad you like this! Thanks for the invite! This wreath is SO wonderful! I’m sure it looked lovely at your wedding. Thanks for sharing this. I just might have to make one for Christmas. Thanks Katie! 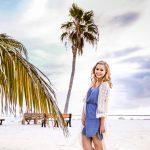 Someday I hope I will get around to writing a post about my wedding – with lots of pictures. I hope you get a chance to make a wreath for Christmas! Okay, you make this look so easy. I may have to give it a try. Pinning this for sure. It turned out beautifully!